Morris Schoonover was born circa 1833 at Indiana. He married Lucinda Hatton, daughter of Robert Hatton and Sarah (? ), on 30 October 1856 at Switzerland, Indiana. Morris Schoonover died after June 1880. [S248] U.S. Federal Census 1860 U.S. Federal Census, by Ancestry.com, Page 21. Dwelling 149. [S247] U.S. Federal Census 1870 U.S. Federal Census, by Ancestry.com, Page 18. Dwelling 130. [S246] U.S. Federal Census 1880 U.S. Federal Census, by Ancestry.com, NA Film Number T9-0243. Page 83C. ED84. Dwelling 105. Name Variation Cyrus Schoonover was also known as Silas. Cyrus Schoonover was born in December 1866 at Illinois. He was the son of Morris Schoonover and Lucinda Hatton. Lesle Schoonover was born in August 1876 at Illinois. She was the daughter of Morris Schoonover and Lucinda Hatton. "plain" Mary Crotchett was born circa 1823 at Illinois. John Crotchett died on 14 February. He was born in 1827 at Illinois. [S249] U.S. Federal Census 1850 U.S. Federal Census, by Ancestry.com, Dwelling 621. William H. Crotchett was born circa 1838. He was the son of John Isaac Crotchett and Elizabeth Perrin. William H. Crotchett died on 17 December 1842. Charles Crotchett was born circa 1821 at Illinois. Charles Crotchett died on 8 March 1847. He was buried after 8 March 1847 at Bradford Cemetery, Pope, Illinois. Name Variation Greenberry Glass was also known as G. B. Name Variation Greenberry Glass was also known as Green Berry. Greenberry Glass was born on 20 February 1820 at Kentucky. He was the son of James Glass and Sarah Lester. Greenberry Glass married Rebecca Nichols on 6 April 1847 at Caldwell, Kentucky, ceremony performed by J. C. Weller. 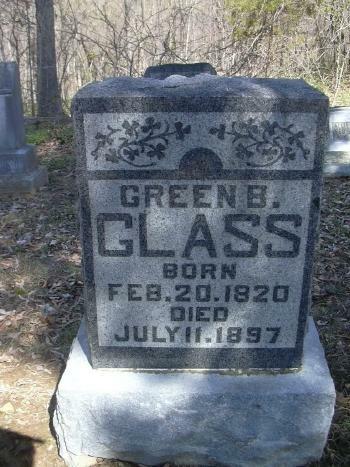 Greenberry Glass died on 11 February 1897 at Pope, Illinois, at age 76. He was buried after 11 February 1897 at Hodge Cemetery, Township 13S Range 6E, Pope, Illinois. 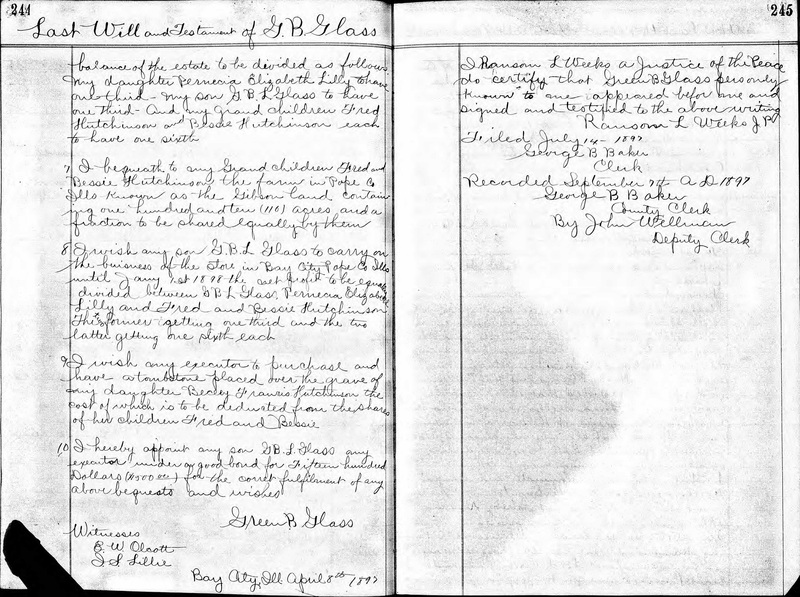 His estate was probated on 8 April 1897 at Pope, Illinois, Will of Greenberry Glass. 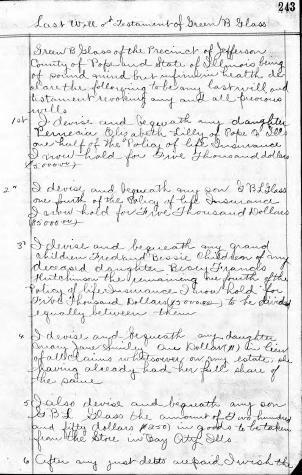 In Elizabeth Christian Bain's will dated 30 October 1879 at Pope, Illinois, Greenberry Glass was named as an heir; Will of Elizabeth Christian Bain Tanner Glass - probate 04 Mar 1880. [S186] Illinois, Illinois Statewide Marriage Index, Vol 00A/ Page 0033 License 00000421. [S249] U.S. Federal Census 1850 U.S. Federal Census, by Ancestry.com, Stamp 361. Dwelling 301. [S248] U.S. Federal Census 1860 U.S. Federal Census, by Ancestry.com, Page 24. Dwelling 174. [S246] U.S. Federal Census 1880 U.S. Federal Census, by Ancestry.com, ED85. Stamp 98C. Dwelling 56. Page 7. Name Variation Happy Crotchett was also known as Harriet. Married Name 9 December 1824 As of 9 December 1824,her married name was Froggett. Name Variation 25 September 1828 As of 25 September 1828, Happy Crotchett was also known as Robinett. She was the daughter of John Crotchett and Patience (?). Happy Crotchett died on 20 August 1881 at age 78. She was buried after 20 August 1881 at Bradford Cemetery, Pope, Illinois. 1840 Pope, Illinois Happy Crotchett was listed as the head of a family on the 1840 Census at Pope, Illinois, Living with Happy Robnett are 1 boy under 5, 2 boys between 5-10, 1 girl under 5, and 1 girl between 5-10. There is no adult male in the household. (Page 175). Happy Crotchett lived with John Crotchett before 1810 at Pope, Illinois. Morrilton, Genealogy Crotchett --- Tanner, Pg 185. [S249] U.S. Federal Census 1850 U.S. Federal Census, by Ancestry.com. [S186] Illinois, Illinois Statewide Marriage Index, 00A/0016. [S186] Illinois, Illinois Statewide Marriage Index, vol 00A/pg 0063. [S4] Illinois, Illinois Marriages to 1850, Frogget, Kappy [Happy] & Robnett, James, 23 Sep 1828. [S249] U.S. Federal Census 1850 U.S. Federal Census, by Ancestry.com, Dwelling 620. Edmund R. Froggett died on 2 July 1827. Name Variation James Robinett was also known as Robnett. James Robinett was born in 1794 at Bourbon, Kentucky, also reported as Illinois. He was the son of Richard Robinett and Ruth Collier. James Robinett died after 1838. [S261] Land Office Records Land Patent Record, by Bureau of Land Management, Accession/Serial #: IL1630__.191 BLM Serial #: IL NO S/N. Married Name 11 February 1918 As of 11 February 1918,her married name was Artz. Ethel Mae Schafer was born on 12 February 1894 at Day, South Dakota. She married Henry John Artz on 11 February 1918 at Day, South Dakota. Ethel Mae Schafer died on 28 May 1982 at Los Angeles, California, at age 88. She was buried after 28 May 1982 at Grand View Memorial Park and Crematory, Glendale, Los Angeles, California. Morrilton, Genealogy Crotchett --- Tanner, Pg 187. Name Variation John Robinett was also known as Robnett. John Robinett was born circa 1837 at Illinois. He was the son of James Robinett and Happy Crotchett. Name Variation Martha Susan Tanner was also known as Susan Martha. Married Name 15 November 1881 As of 15 November 1881,her married name was Hilderbran. Married Name 15 November 1881 As of 15 November 1881,her married name was Hilderbrand. Martha Susan Tanner was born on 13 April 1855 at Golconda, Pope, Illinois. She was the daughter of Thomas Wootten Tanner Jr and Martha I. McFarlin. Martha Susan Tanner died on 2 July 1927 at Pope, Illinois, at age 72 Martha Susan Hildebran, the oldest daughter of Thomas W. Tanner, deceased, was born near Golconda, April 13, 1855, and passed away at her home, near Waltersburg, July 2, 1927, aged 72 years, 3 months and 19 days. She was buried on 3 July 1927 at Pope, Illinois. Martha Susan Tanner had 2 with 1 living in 1900 children. She had 2 with 1 living in 1910 children. [S186] Illinois, Illinois Statewide Marriage Index, volume 00A/page 0050 license 106. 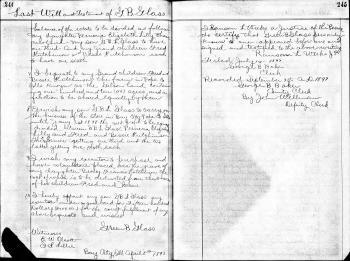 [S238] Illinois Death Records, by Illinois, certificate 0760047. [S245] U.S. Federal Census 1900 U.S. Federal Census, by Ancestry.com, ED59. Dwelling 217. [S244] U.S. Federal Census 1910 U.S. Federal Census, by Ancestry.com, ED83. Dwelling 167. [S243] U.S. Federal Census 1920 U.S. Federal Census, by Ancestry.com, ED101. Dwelling 85. Name Variation Mary Elizabeth Tanner was also known as Elizabeth. Married Name 24 February 1880 As of 24 February 1880,her married name was Moyers. Mary Elizabeth Tanner was born in February 1858 at Golconda, Pope, Illinois, also reported as 1857. Mary Elizabeth Tanner died in April 1912 at age 54. Mary Elizabeth Tanner had 5 with 2 living in 1900 children. She had 5 with 2 living in 1910 children. [S186] Illinois, Illinois Statewide Marriage Index, volume 00A/page 0029 license 373. [S246] U.S. Federal Census 1880 U.S. Federal Census, by Ancestry.com, NA Film Number T9-0243. Page 133C. ED86. Dwelling 374. [S245] U.S. Federal Census 1900 U.S. Federal Census, by Ancestry.com, ED60. Dwelling 66. [S244] U.S. Federal Census 1910 U.S. Federal Census, by Ancestry.com, ED84. Dwelling 82. Charles Ewing Tanner was born on 23 December 1859 at Golconda, Pope, Illinois. He was the son of Thomas Wootten Tanner Jr and Martha I. McFarlin. He was buried after 16 September 1944 at IOOF Cemetery, Golconda, Pope, Illinois. Morrilton, Genealogy Crotchett --- Tanner, page 152. [S186] Illinois, Illinois Statewide Marriage Index, certificate 0036646. [S245] U.S. Federal Census 1900 U.S. Federal Census, by Ancestry.com, ED59. Dwelling 344. [S243] U.S. Federal Census 1920 U.S. Federal Census, by Ancestry.com, ED101. Dwelling 103. [S250] U.S. Federal Census 1930 U.S. Federal Census, by Ancestry.com, ED76-6. Dwelling 127. [S373] U.S. Federal Census 1940 U.S. Federal Census, by Ancestry.com, Year: 1940; Census Place: Golconda, Pope, Illinois; Roll: T627_869; Page: 10B; Enumeration District: 76-7. Name Variation Emily Jane Tanner was also known as Jane. Married Name 28 May 1889 As of 28 May 1889,her married name was Gregory. Emily Jane Tanner was born on 8 March 1861 at Golconda, Pope, Illinois. Emily Jane Tanner died on 31 December 1916 at age 55. Emily Jane Tanner had 3 with 3 living in 1900 children. [S186] Illinois, Illinois Statewide Marriage Index, volume A-1/ page 134 license 940. [S245] U.S. Federal Census 1900 U.S. Federal Census, by Ancestry.com, ED59. Dwelling 278. [S244] U.S. Federal Census 1910 U.S. Federal Census, by Ancestry.com, ED83. Dwelling 299. Name Variation Thomas L. Wootten Tanner was also known as Tom L.
Name Variation Thomas L. Wootten Tanner was also known as Tomas W.
Name Variation Thomas L. Wootten Tanner was also known as Thomas W.
Thomas L. Wootten Tanner was born on 16 July 1865 at Golconda, Pope, Illinois, also reported as Jul 1866. Thomas L. Wootten Tanner and Kate Wallace were divorced before 1909. Thomas L. Wootten Tanner died on 9 September 1935 at Scott, Missouri, at age 70 Thomas W Tanner obituary. He was buried on 10 September 1935 at IOOF Cemetery, Golconda, Pope, Illinois, funeral held in Sikeston, Missouri. The L. is only an initial to distinguish him from the other Thomas Wootten Tanners. Morrilton, Genealogy Crotchett --- Tanner, page 156. [S186] Illinois, Illinois Statewide Marriage Index, vol A-1/ page 0140 license 00001022. [S243] U.S. Federal Census 1920 U.S. Federal Census, by Ancestry.com, ED196. Dwelling 133. [S250] U.S. Federal Census 1930 U.S. Federal Census, by Ancestry.com, ED101-17. Dwelling 107. Name Variation Levi Tanner was also known as John. Levi Tanner was born on 12 September 1869 at Golconda, Pope, Illinois. Levi Tanner married Katherine Eliza Trimble, daughter of James Alexander Trimble and Maria Rebekah Cruse Young, on 16 November 1911. 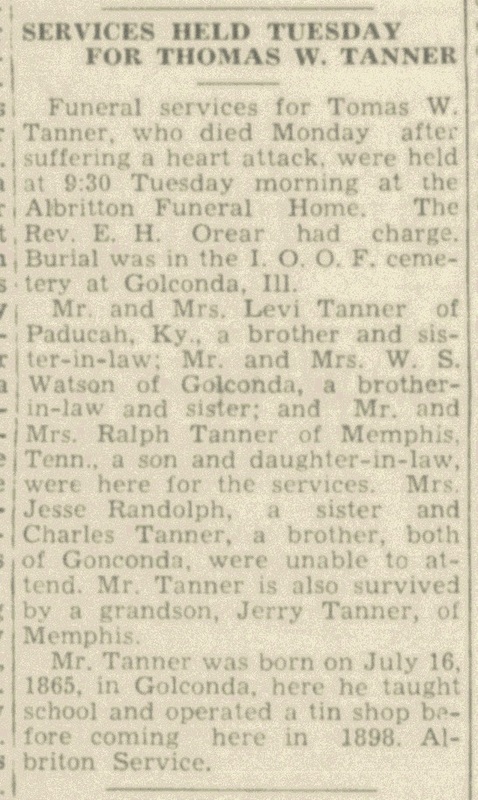 Levi Tanner witnessed the burial of Thomas L. Wootten Tanner on 10 September 1935 at IOOF Cemetery, Golconda, Pope, Illinois; funeral held in Sikeston, Missouri. Levi Tanner died on 14 August 1949 at McCracken, Kentucky, at age 79. He was buried after 14 August 1949 at IOOF Cemetery, Golconda, Pope, Illinois. Morrilton, Genealogy Crotchett --- Tanner, page 157. [S244] U.S. Federal Census 1910 U.S. Federal Census, by Ancestry.com, ED83. Dwelling 212. [S243] U.S. Federal Census 1920 U.S. Federal Census, by Ancestry.com, ED101. Dwelling 62. Married Name 4 September 1895 As of 4 September 1895,her married name was Vickers. Nellie Tanner was born on 17 January 1871 at Golconda, Pope, Illinois, also reported as Jan 1873. Nellie Tanner died on 12 March 1904 at age 33 also reported as 12 Mar 1903. She was buried after 12 March 1904 at Hastings Cemetery, Pope, Illinois. Nellie Tanner had 4 with 4 living in 1900 children. 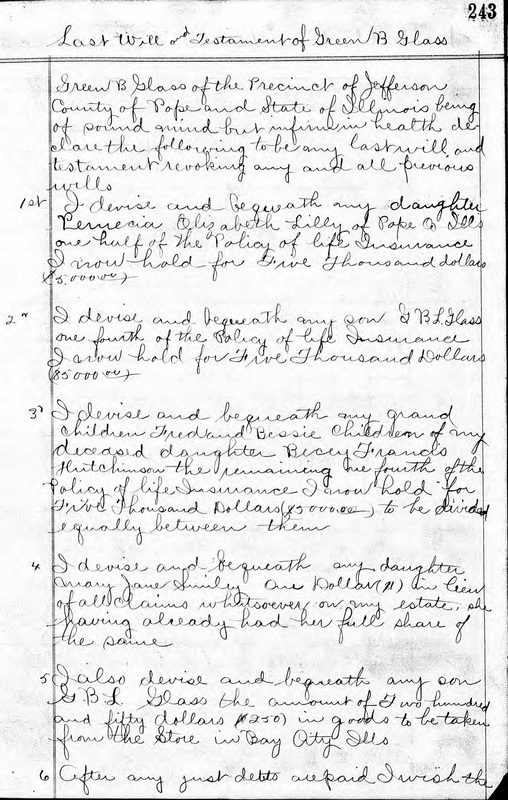 [S186] Illinois, Illinois Statewide Marriage Index, volume A-1/page 0212 license 1948. [S245] U.S. Federal Census 1900 U.S. Federal Census, by Ancestry.com, ED62. Dwelling 303. Name Variation Estelle Tanner was also known as Estella. Married Name 3 August 1904 As of 3 August 1904,her married name was Watson. Estelle Tanner was born on 2 November 1876 at Golconda, Pope, Illinois. Estelle Tanner married William Smiley Watson Jr., son of William Smiley Watson Sr. and Nancy Elizabeth Hodge, on 3 August 1904 at Golconda, Pope, Illinois. 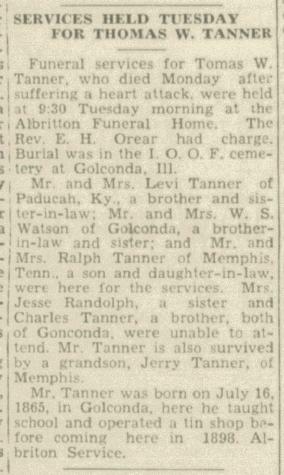 Estelle Tanner witnessed the burial of Thomas L. Wootten Tanner on 10 September 1935 at IOOF Cemetery, Golconda, Pope, Illinois; funeral held in Sikeston, Missouri. Estelle Tanner died on 17 July 1968 at Illinois at age 91. She was buried after 17 July 1968 at IOOF Cemetery, Golconda, Pope, Illinois. Children of Estelle Tanner and William Smiley Watson Jr.
[S244] U.S. Federal Census 1910 U.S. Federal Census, by Ancestry.com, ED84. Dwelling 106. Second page missing from Ancestry.com (which likely includes children). [S243] U.S. Federal Census 1920 U.S. Federal Census, by Ancestry.com, ED102. Dwelling 153. [S250] U.S. Federal Census 1930 U.S. Federal Census, by Ancestry.com, ED76-5. Dwelling 130. [S373] U.S. Federal Census 1940 U.S. Federal Census, by Ancestry.com, Year: 1940; Census Place: Golconda, Pope, Illinois; Roll: T627_869; Page: 9B; Enumeration District: 76-6. Name Variation Anna Eliza Rigor was also known as Eliza. Married Name 27 April 1880 As of 27 April 1880,her married name was Tanner. Anna Eliza Rigor was born on 17 March 1852 at Rising Sun, Ohio, Indiana, also reported as March 1853, 1854 or March 1851. She was the daughter of George Washington Rigor and Martha Ann Blackburn. Anna Eliza Rigor married Thomas Wootten Tanner Jr, son of Thomas Wootten Tanner Sr and Elizabeth Christian Bain, on 27 April 1880. Anna Eliza Rigor died on 19 January 1931 at Road Dist 5, Union, Illinois, at age 78. She was buried on 21 January 1931 at Prospect Cemetery, Brownfield, Pope, Illinois. Anna Eliza Rigor had 3 with 1 living in 1910 children. [S248] U.S. Federal Census 1860 U.S. Federal Census, by Ancestry.com, Page 12. Dwelling 79. [S247] U.S. Federal Census 1870 U.S. Federal Census, by Ancestry.com, Page 87. Dwelling 725. [S244] U.S. Federal Census 1910 U.S. Federal Census, by Ancestry.com, ED84. Dwelling 323. Lena May Tanner was born on 11 March 1881 at Golconda, Pope, Illinois. She was the daughter of Thomas Wootten Tanner Jr and Anna Eliza Rigor. Lena May Tanner died on 2 May 1881. James Albert Tanner was born on 7 April 1882 at Golconda, Pope, Illinois. He was the son of Thomas Wootten Tanner Jr and Anna Eliza Rigor. James Albert Tanner died on 2 October 1883 at age 1. 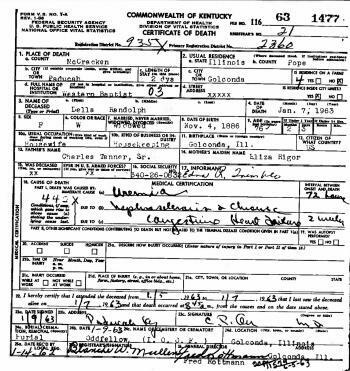 Married Name 23 November 1911 As of 23 November 1911,her married name was Randolph. Della May Tanner was born on 4 November 1886 at Golconda, Pope, Illinois, 1900 census reports birth as November 1887. Della May Tanner married Jesse Edward Randolph, son of John L. Randolph and Susan Jane Woods, on 23 November 1911 at Cairo, Alexander, Illinois. Della May Tanner died on 7 January 1963 at Paducah, McCracken, Kentucky, at age 76. She was buried after 7 January 1963 at IOOF Cemetery, Golconda, Pope, Illinois. Della May Tanner obtained US Social Security Card at Illinois; last residence not specified. [S250] U.S. Federal Census 1930 U.S. Federal Census, by Ancestry.com, ED76-5. Dwelling. [S373] U.S. Federal Census 1940 U.S. Federal Census, by Ancestry.com, Year: 1940; Census Place: Golconda, Pope, Illinois; Roll: T627_869; Page: 8B; Enumeration District: 76-6. Reuben Rowland was born on 8 October 1838 at Pope, Illinois. 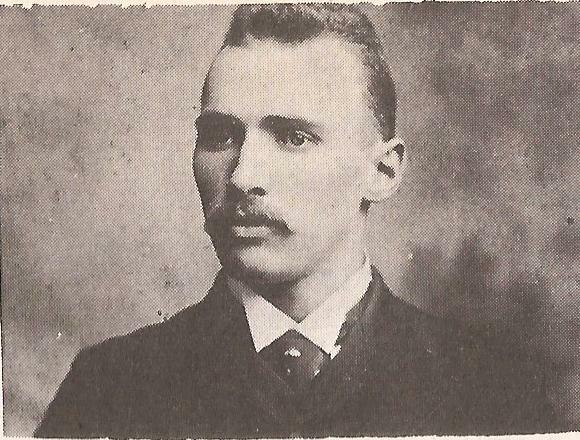 He was the son of Reuben Rowland and Hannah Elizabeth Dyer. Reuben Rowland died on 24 March 1879 at Miami, Kansas, at age 40. [S266] History of Kansas - Miami County, online, written in 1883. 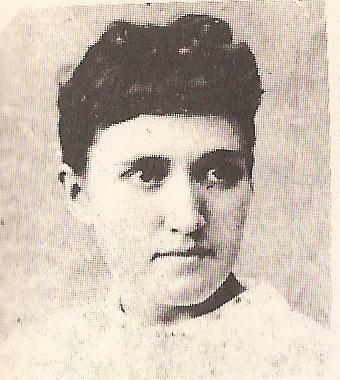 Indianna Rowland was born in 1861 at Pope, Illinois. She was the daughter of Reuben Rowland and Amanda Jane Tanner. Indianna Rowland died before 1883. Name Variation Thomas Logan Rowland was also known as T. L.
Thomas Logan Rowland married Leona Candace Haffner, daughter of John Baltzer Haffner and Louisa Victoria Robeson. Thomas Logan Rowland was born on 18 August 1863 at Pope, Illinois. He was the son of Reuben Rowland and Amanda Jane Tanner. Thomas Logan Rowland and Leona Candace Haffner were divorced before 1920. 1 March 1885 Wea, Miami, Kansas Thomas Logan Rowland appeared on the census of 1 March 1885 in the household of Amanda Jane Tanner at Wea, Miami, Kansas. [S244] U.S. Federal Census 1910 U.S. Federal Census, by Ancestry.com, ED108. Dwelling 98. Morrilton, Genealogy Crotchett --- Tanner, page 163. Name Variation Andrew Mason Rowland was also known as Mason Andrew. 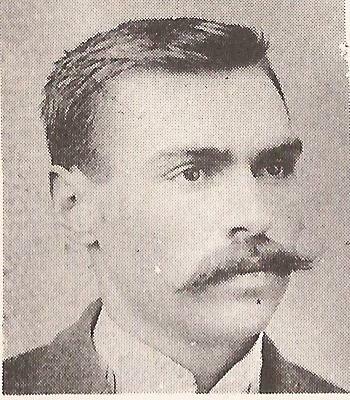 Andrew Mason Rowland was born on 6 February 1865 at Pope, Illinois, also reported as Feb 1863. Andrew Mason Rowland married Kathryn M. West, daughter of Dr. William West and Ann Haigler, circa 1900 at first marriage for him; second for her. Andrew Mason Rowland died on 16 January 1939 at age 73 died of heart disease. 1 March 1885 Wea, Miami, Kansas Andrew Mason Rowland appeared on the census of 1 March 1885 in the household of Amanda Jane Tanner at Wea, Miami, Kansas. [S245] U.S. Federal Census 1900 U.S. Federal Census, by Ancestry.com, Year: 1900; Census Place: Kansas City Ward 10, Jackson, Missouri; Roll: 864; Page: 6B; Enumeration District: 0116; FHL microfilm: 1240864. [S244] U.S. Federal Census 1910 U.S. Federal Census, by Ancestry.com, Year: 1910; Census Place: Kansas Ward 4, Jackson, Missouri; Roll: T624_788; Page: 3A; Enumeration District: 0170; FHL microfilm: 1374801. [S250] U.S. Federal Census 1930 U.S. Federal Census, by Ancestry.com, Year: 1930; Census Place: Kansas City, Jackson, Missouri; Roll: 1198; Page: 9A; Enumeration District: 0138; Image: 695.0; FHL microfilm: 2340933. 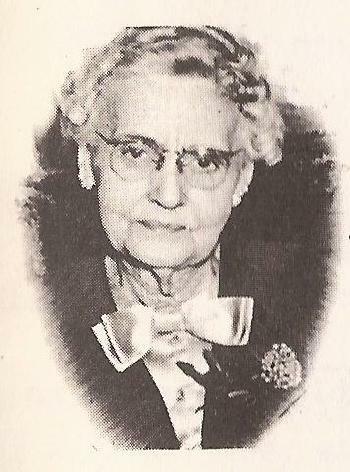 Lucy Jane Rowland was born in 1868 at Missouri. Lucy Jane Rowland died before 1883.